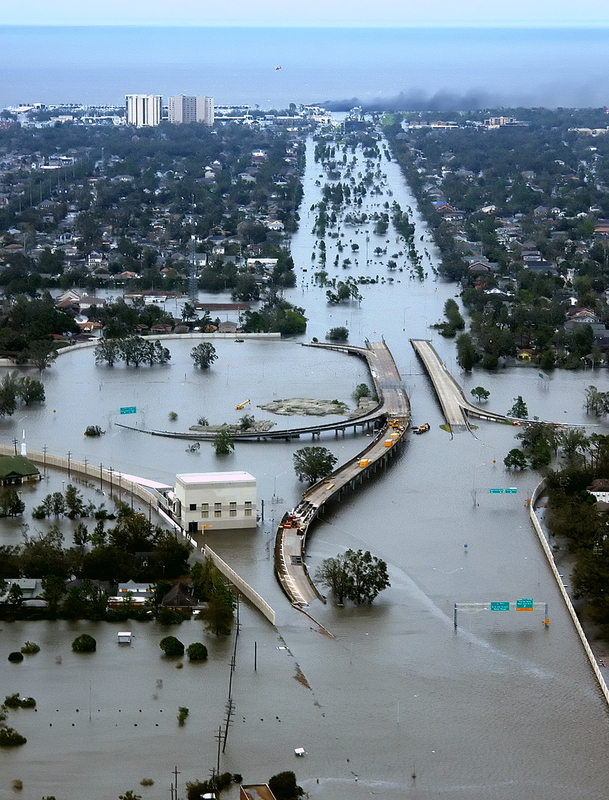 This week Cyclone Center introduces Hurricane Katrina (2005) as one of our featured storms. This is the 8th anniversary of Katrina’s assault on the northern Gulf of Mexico coast. The city of New Orleans, despite a massive system of protective levees and pumps, lost over 1500 souls, almost all from drowning when water flooded about 80% of the city. Since then, millions of dollars have been spent on the repair and upgrade of the levee system in and around metro New Orleans. Are they ready for the next one? New Orleans flooding caused by 60 kt. winds, 10-14 ft. storm surge. Category-5 values: 140 kt winds, 25-35 ft. storm surge. But what exactly is a “Katrina-level” storm? Winds in downtown New Orleans rarely exceeded minimal hurricane force at the peak of the event. Storm surge and the strongest winds from the weakening Katrina were focused well to the east in coastal Mississippi. And yet levees failed, water flooded significant portions of the city, and over 1,500 perished. An even bigger concern in the long-term are geological changes occurring in the area; coastal portions of Louisiana are sinking into the ocean as climate-forced sea levels continue to rise and land areas sink. This exacerbates the threat of hurricanes for a region that experiences one on average every couple of years. Many climate scientists now believe that hurricanes will be stronger on average in the future as the ocean, which provides the fuel for the storms, continues to warm. What more should be done? Government officials exude confidence that the improvements to the levy system will hold up, but we’ve heard that story before. Claims were made soon after Katrina that the levee system was designed to withstand a Category-3 storm , not something like “Katrina’s strength”. We’ve already seen that Katrina wasn’t even a hurricane in New Orleans – what happens when a real Category-4 or 5 storm hits the area? We can only hope that residents will have left, because it’s a very good bet that there will be little dry land to stand on.